Technology’s potential to ally itself with the access to justice movement presents unique opportunities for cross-organizational collaboration. Technology can support the development, deployment, and assessment of legal services, while simultaneously enabling justice providers to engage the public through software interfaces and analytical insights. Yet, technology can be limited by its application. Merely collecting data or designing a user interface cannot alone solve the Justice Gap. Rather, technology integrated across systems truly makes a difference. On May 19, 2018, our Access to Justice Fellow, Eduardo Gonzalez, participated in Florida Justice Technology Center’s Legal Aid Virtual Hackathon. Together with Katherine Alteneder, Stephan Tillman, and Jordan Place, he set out to design a technology project that integrates communication, data collection, and multi-institutional collaboration. The goal of the project was to develop a browser extension that serves as both a resource and communication tool for the justice community. The inspiration behind the Justice Reach Extension (JRE) Project comes from Eduardo's fellowship research, where he is conducting a national survey of court-based projects for self-represented litigants. Eduardo's project has required him to deal with problems of scattered information: decentralized databases about court-based projects (especially in states without uniform court systems), ever-changing project managers and operators, differences across reporting methods, and the reality that many projects go unreported and unnoticed. These inspired him to imagine a way to use technology to scale and sustain data collection and maintenance. The result of the hackathon was the Justice Reach Extension prototype (for a video demo, click here). The JRE is an easy-to-use tool for users to post, update, browse, and collaborate on access to justice projects. A critical feature of the tool is a simple and easily adopted interface (UI) that minimizes the burden of reporting project activity. Eduardo modeled the tool using Adobe’s InVision Studio App and simulated aspects of its proposed functions using a survey created on SurveyMonkey. Users can “Update” their projects to keep the information current. The tool collects information in a single database users can “Browse” by selecting search filters that match the input categories. For example, if a user wants to see all court-based projects dealing with Guardianship and funded by a State budget, they would select “court-based” for organization type, “guardianship” for case type,” and “state” for funding type. The JRE would show a list of matching projects the user selects to get contact information for the project manager and other information that could help their own projects. Users also have the option to choose to follow projects for updates and announcements they receive via push-notifications or a personalized JRE “Project Feed.” After posting a project, a quick link to the project profile would appear in the user’s “Project Library.” Finally, the “Workshop” feature would allow multiple users to access the project profile and share resources that only users with the necessary permissions could access. What is next for the JRE? The UI submitted to the hackathon is a low- to medium-fidelity prototype and various features of the JRE are missing. The functions described here are features that would form the core of the JRE, but the vision is for courts, legal aid organizations, and Bar associations to share information about their projects and collaborate across their institutions. If, for example, a court is considering adopting e-filing, a court employee could “Browse” the database to identify project managers, in or out of state, working on a similar project, including those organizations that have successfully deployed an e-filing program. The aim is to enable and support communication across justice providers. Because the JRE requires user profiles, the JRE database and user profiles need to be stored on a secure server—whether a trusted web server or cloud-based service. JRE’s technical aspects need to be compliant with organization and court network requirements to recruit providers across the justice ecosystem. The JRE database is also limited by the information that users contribute. Although installing a browser extension is straightforward, without user contributions, there is no data to query. One solution is to generate an initial database from existing datasets that users can immediately access. These datasets can come from publicly available information on the Legal Services Corporation (LSC) website, the American Bar Association (ABA) website, and from project and resource datasets collected by courts and Access to Justice Commissions. While the goal of the JRE is to get justice providers to post and browse projects, the database will be openly available to the public and to entities like LSC, the ABA, and the National Center for State Courts. If there is a privacy concern about sensitive project information, the JRE could implement permission levels, whereby users select what authorize only certain information to be public. Finally, the issue of maintenance. The biggest technological challenge facing the justice community is the burden and cost of maintenance. Seldom do legal aid organizations or courts have digital curators or dedicated staff members that track changes, milestones, and updates to their work for the public—rarer still are those entities that are able to continuously report on their work. Without a dedicated curator, the JRE risks becoming quickly out of date. As such, it is important for the central JRE organizer to be able to push notifications to users for information and periodically review the dataset for major errors. This may take the form of a full time data manager or increasing opportunities for technology fellows, but the responsibility of maintaining the database should be one taken by an organization working on a national level. What comes next? Continued development. Although the hackathon has ended, the energy remains. The next goal is to create a functional prototype for the features described above. Then comes testing, redesigning, and more testing iterations. For the JRE to succeed, it must be one that the justice system believes in, and one that organizations want to adopt. While there are many technology tools and solutions that address the Justice Gap, there are certain principles that can activate the Access to Justice Movement--one of which is knowledge sharing. Without cross-disciplinary and cross-organizational collaboration, all endeavors are destined to meet the same obstacles. The challenge is too great for any one organization, greater still for any single project. The solution is one that builds momentum. 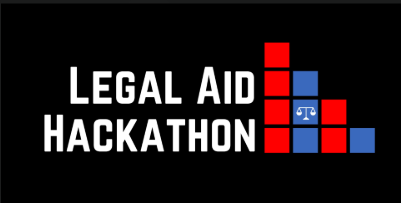 You can view Eduardo's Legal Aid Hackathon Presentation at this link.